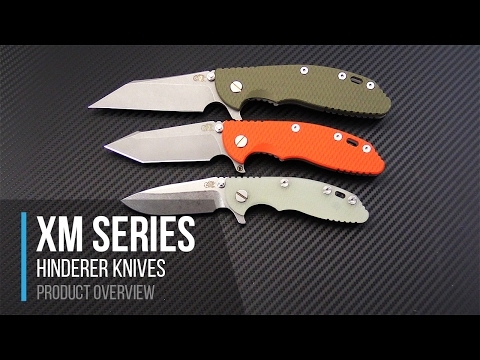 The Hinderer Knives XM-18 3.5" Fatty Wharncliffe is a precision-crafted hard-use tactical folder. Nearly identical to the regularly produced XM-18, the Fatty version has a beefed up blade measuring in at 0.185" thick. Overall handle thickness and weight has also increased slightly to provide a palm filling grip of this muscled up beast. This version comes with a Stonewashed Black DLC 20CV Fatty Wharncliffe blade, matching titanium frame lock and Orange G10 scale. The Gen 6 features a hardened steel lock face insert and Tri-Way Pivot system detailed below. 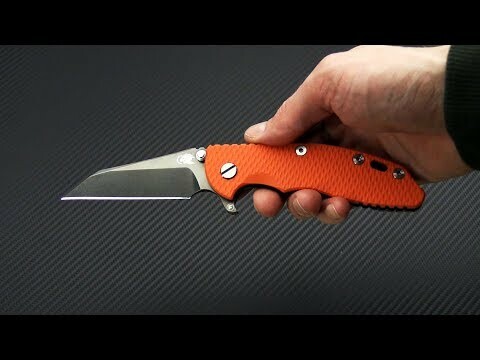 Blade: The 0.185" thick three and a half inch blade has a Stonewashed Black DLC (Diamond-Like Carbon) finish and can be opened via the integral flipper or dual thumb studs/blade stops. Rick's innovative Tri-Way pivot system creates silky smooth operation with the installed ball bearings with the option to switch to nylon or bronze washers for enhanced customization. The extended flipper features an "F" indicating this is a Fatty Edition XM-18 and the Tri-Way pivot icon on the reverse. This Fatty Wharncliffe is durable while still delivering good cutting performance for hard utility use. Handle: Full titanium frame lock and liner are have a matching DLC finish that is discreet and hides wear well. Titanium hardware and standoffs create one tough package while 3D texturing on the G-10 scale coupled with jimping all around create a solid grip. The integral frame lock is smooth, reliable and robust, enhanced with the hardened steel lock face and the iconic Hinderer Lockbar Stabilizer. Carries via a reversible, right-hand, titanium pocket clip. About the Fatty: The Fatty Edition XM-18 fits regularly produced 3.5" handle scales, handle screws and pivot. XM-24 Standoffs. Handle nuts are Fatty Specific. CPM 20CV: CPM 20CV is a highly wear resistant, powder metallurgy stainless tool steel, an analog to Bohler's M390, and offers some of the best corrosion resistance and wear resistance in combination with a relative ease of sharpening. These properties along with a working hardness in the low 60s HRC make 20CV a prime choice among custom and production makers.